Like so many things in Japanese culture, the Japanese tea ceremony is governed by deeply rooted traditions and rules of conduct. If you are a visitor in Japan, this beautifully choreographed ritual of green tea will provide a real glimpse of the reverence that Japanese people have for tradition. Tea has long been valued in Japan for its health benefits and elegance. It was used by Buddhist monks to stay awake during meditation and has been the subject of beautiful poetry. The tea used in the ceremony is matcha, a powdered form of green tea with a slightly bitter taste and is stirred into hot water with a bamboo whisk. In the ceremony, the bitterness of the tea is balanced by serving Japanese sweets. 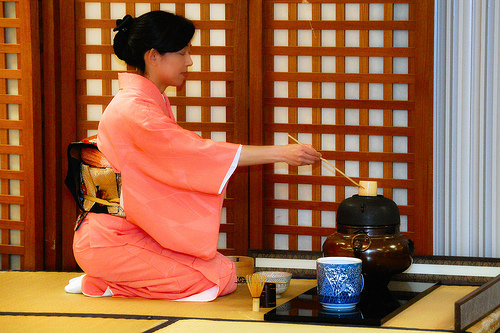 The four major aspects of the tea ceremony are taken from Zen Buddhist traditions. First, rules – the rules of tea preparation paralleled the rules of monastic living and are highly revered (it takes years of training to conduct a proper tea ceremony). Second, setting – the entire ceremony must take place in one tea room, which is a traditional Japanese room with tatami flooring, sliding doors and occasionally an entrance that requires guests to crawl through, demonstrating personal humility. Third, behaviour – the host and guests must strive to create an atmosphere of harmony and mutual respect. And fourth, taste – the tea ceremony aims for aesthetic perfection and each item is carefully selected to reflect the tastes of the host and the culture of tea making. The host of the tea ceremony has likely spent years perfecting their duties, but as a guest you have significantly fewer responsibilities to remember. First, be prompt; your host will wait for you, but delaying the tea ceremony is disrespectful, especially in Japan where strict punctuality is observed for important events. Remove your shoes when you enter. Most of the time a host will offer you slippers to wear inside. Since taste is such an important part of the tea ceremony, guests should admire their surroundings: the tea bowl, the china, the room itself; and be sure to express their admiration sincerely and remark on their meaning to their host. This is the most important role of the guest. When tea has been served, be sure to drink your entire portion (portions are quite small), and eat everything that is served to you. When drinking from your tea cup (or bowl might be more accurate), turn it sideways slightly to avoid drinking from the front. Your last sip should be an audible slurp – don’t be shy, it’s the custom!